Ever since 2006, when they proved that a video of four men dancing on treadmills could capture the short attention spans of millions, OK Go has been the archetype for how a modern band stays relevant, especially in a music industry that struggles to grasp the changing habits of its listeners. One of the changes OK Go seems to have clued into is how a band's creative output is measured in the first place. The Los Angeles-based rock group's new record, Hungry Ghosts, comes out in October—a full four years after the release of their previous full-length album. That might seem like a long wait, but the truth is there's really no such thing as waiting when it comes to OK Go. There's always something—a video, a show, an app—around the corner. And OK Go's various releases, in whatever form they take, are made to be experienced and shared rather than packaged and sold. That's an idea lead singer and guitarist Damian Kulash says isn't completely new. "[Music] is turning into a much more ephemeral thing again, like it was before the 1920s—before it became a commodified thing," Kulash says. "That makes it super hard for some of us to figure out how to make a living, but it does sort of take the shackles off certain notions about what a musician is supposed to do." OK Go is probably best known for eschewing the notion that a band's contribution to a music video is simply to show up and lip sync. All four band members individually and collectively put as much muscle into their visual performances as they do their recordings. The group's videos—featuring choreographed dances, performances alongside trained dogs or immensely complicated Rube Goldberg contraptions—aren't mere promotional tools in service of a single; they're separate and complementary creative acts of their own. 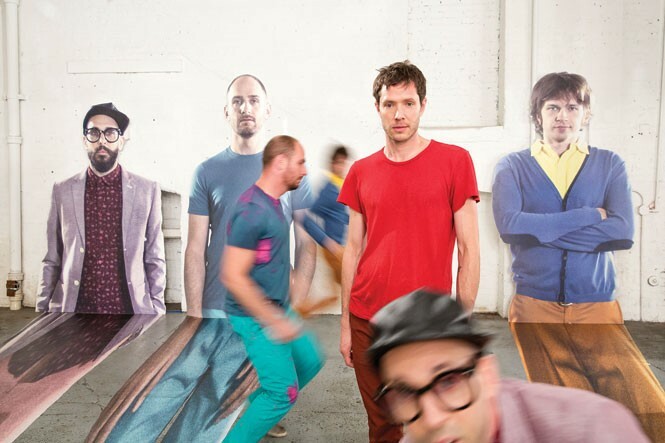 OK Go's embrace of mixed media has always been a part of the band's makeup, Kulash says. When the band was first starting out in Chicago, Kulash—who studied semiotics at Brown University—would design and screen print the band's early posters. "I don't think we distinguish the same way most people do between different forms of creativity," Kulash says. "There's this idea that people who play songs are musicians and people who make images are filmmakers. We're all making ones and zeroes, and we're all putting it out on the same place." But clickbait doesn't go far if there's no hook attached that's why the strength of OK Go's stompy power-pop records has always been the other half of the band's viral success. OK Go is now touring with a batch of new songs that Kulash says comes from having had some time to discover themselves as a group. Kulash describes Hungry Ghosts as an homage to their earliest influences: the '80s dance pop of Prince, New Order and Depeche Mode that they fell in love with as kids. "I think it took us a while to figure out that there's a way for us to do that [music] in a way we still feel genuine about," Kulash says. "I hope we're not being retro. It just feels like you can tell that's the music we grew up on." The band's latest single, "The Writing's on the Wall," features the tight percussion and icy guitar sounds of that era. The song addresses how it feels when the end of a relationship feels not just near, but inevitable, and it reveals a malaise not typically found in OK Go's traditionally upbeat singles. But what is the same is the group's canny sense of visual style. The single premiered online with a video that follows the band members in a single take as they insert themselves in various mind-bending optical illusions. It's gotten close to 10 million views on YouTube in the month since its debut. As for what else the band has planned before the new album comes out, fans will have to wait—but likely not that long. "We chase all of our creative ideas," Kulash says. "You just try to keep them all in balance."